“More than skin deep” is Forever Aloe Scrub. With its unique combination of stabilized aloe vera gel and solid micro-spheres made from pure Jojoba Oil, this effective skin cleanser is gentle enough for everyday use and strong enough to clear away the debris that accumulates in the delicate pores of the skin. In combination, these two natural ingredients will clear the way for the skin’s own unique renewal process, while helping to protect it from the drying and damaging effects of synthetic cleansers. 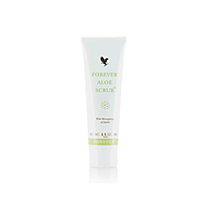 Forever Aloe Scrub gently scrubs away dead skin cells and debris that clog pores and dull the skin’s appearance, to begin revealing radiant “new,” healthier skin.